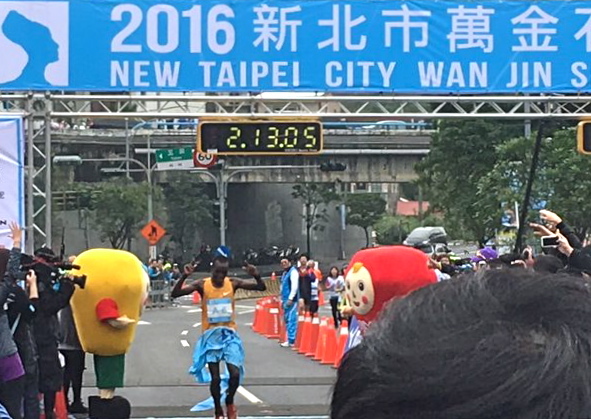 In hopes of breaking their year-old 2:13:14 course record the organizers of Taiwan's New Taipei City Wanjinshi Marathon brought in three 2:08 men, Kenyans William Chebon Chebor and Julius Ndiritu Karinga and Japan's Yuki Kawauchi (Saitama Pref. Gov't), to give it a go. 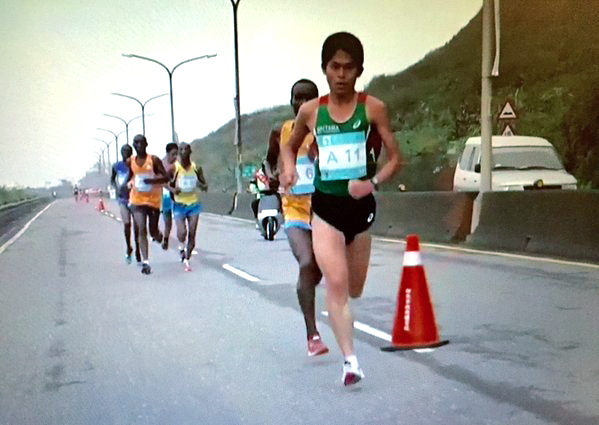 Running to show his support for the victims of last month's Tainan earthquake, Kawauchi took the challenge to heart. 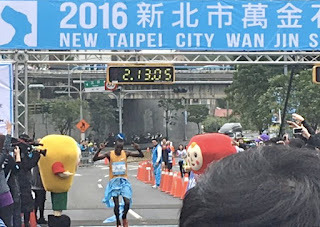 With a tough uphill first 5 km including a long tunnel he pushed things at sub-2:10 pace, unusually aggressive against tough competition and quickly disposing of everybody but Chebor and Karinga. 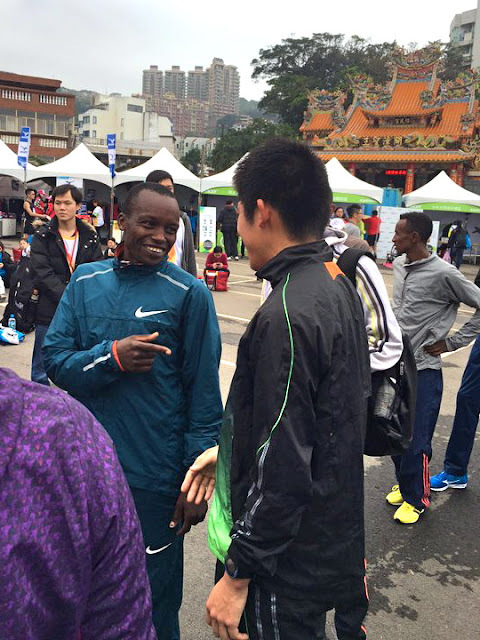 Both took turns attacking, Chebor in particular matching Kawauchi's aggression with multiple hard surges. The lead changed countless times between all three but nobody got away cleanly. At halfway Kawauchi led in 1:05:15, Karinga a second behind and Chebor one more back. 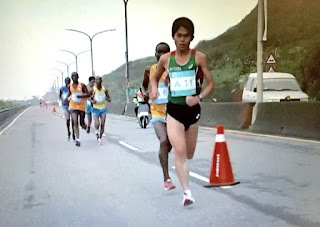 Around 23 km Chebor threw in another hard surge and this time neither Kawauchi nor Karinga could stay with him. It looked like too much too far out, but Chebor's judgment proved sound as he ran the rest of the way in unthreatened. A hard kick coming out of the tunnel was enough to score him a new course record as he won in 2:13:05. Kawauchi and Karinga stuck together through 35 km before Kawauchi said goodbye, putting in a long surge that brought him closer to Chebor and gave him 2nd in 2:14:12. Karinga faded to 3rd in 2:14:52, nearly run down by Ethiopian Belay Mamo Abadoyo on the last downhill. Kenyan Hellen Wanjiku Mugo also took the women's race out aggressively, on 2:25-flat pace with a lead of over a minute and a half by 10 km and stretching it out to a lead of almost four minutes before things started to fall apart. Between 30 km and 35 km Mugo was so spent that she actually stopped to turn around and look to see if anyone was catching her, barely shuffling when she turned back around to start running again. 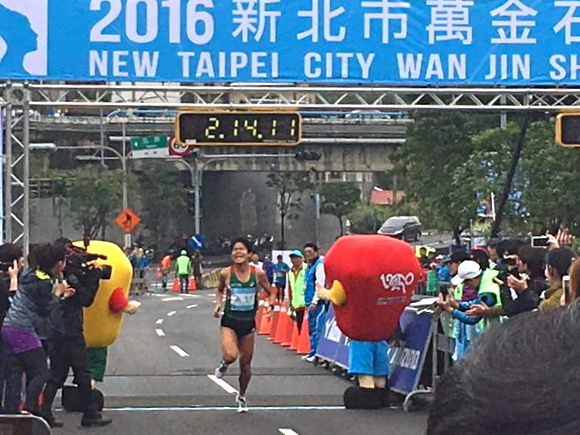 Ukrainian Olha Kotobska quickly gunned her down, coming up just short of the course record to win in 2:36:38. An Ethiopian trio led by Bentu Shiferaw Wodajo likewise overtook Mugo to sweep the next three spots, Mugo staggering in to finish 5th in 2:40:14. 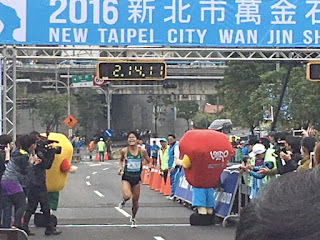 Masters runner Chihiro Tanaka (AthlecAC), like Kawauchi appearing with support from JRN, was 9th overall as the top Japanese woman.